(Lunch will be served at noon, followed by a presentation and some entertainment). March 3rd is “Momo-no-Sekku” (also known as Girls’ Day) in Japan. Originally, it was celebrated by families with young daughters for their children’s happiness and good health. Here at Momiji, we will celebrate “Momo-no-Sekku” as the arrival of spring, wishing health and happiness to all children, as well as to our Momiji tenants and their families and friends from the community. There will be a festive lunch, special entertainment guests, and much more! Don’t miss this fun-filled seasonal special event! Purchase a lunch ticket ($11.00) from Shivonne/Scott by Thurs. Feb. 28! This annual tradition is back! Enjoy delicious Japanese cuisine, including manju, sushi, chow mein and bento boxes. There will be plenty of home made pies, cookies and squares. Our dining room allows you to eat in or take out. There will also be plenty of items for sale including Collectibles, Giftware, Jewellery, Japanese Kitchen Wares, Books, a Garage Sale and much more. Interested in volunteering? Volunteers are needed leading up to the day of the Bazaar, for sorting donations, for helping to make delicious Japanese cuisine and of course for set-up. Proceeds from the Bazaar are used to support our programs and services. Hundreds of seniors benefit each year from the funds this event generates. For more information, contact Sheri-Lynn at 416-261-6683 x259 / Sheri-Lynnl@momiji.on.ca. Momiji is hiring part-time and on-call Personal Support Workers. Please click here for details. To me, the Holiday Season is all about family, food and friends and it is also a time to reflect. While you may know me best as the Chair of the Board of Directors at Momiji Health Care Society, my father lives at Momiji, which also makes me a family member of one of the tenants as well. In this role, I see first hand what excellent care and respect he receives from the staff at Momiji. I am sure any of our tenants or their family members will tell you the same thing. In the time that I have personally been involved with Momiji, I have seen so many changes. The biggest is the health of the seniors. 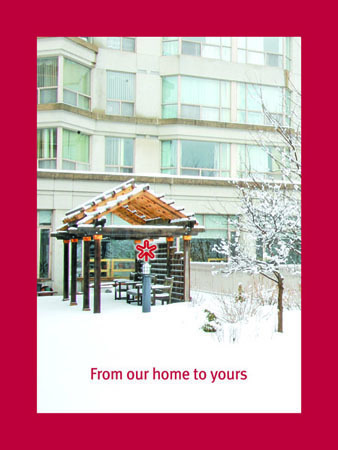 Since few tenants move out of Momiji each year, our waiting list, currently over 750 individuals, continues to grow. By the time the seniors move into Momiji, they are on average much older. With age comes increasingly complex care needs, much more than a supportive housing organization can provide. The daily tasks for our 29 PSWs include safety checks, medication reminders, personal care, homemaking (i.e. shopping, light meal preparation), medical/non-medical escorting, health promotion/consultation, and joint services with outside providers of foot care, physiotherapy, and family physician clinics. Increasingly, our PSWs are required to do heavier personal care for many of our tenants. An incredible 55,170 days of personal care services were delivered in the past year alone, and the demand continues to rise. With demand, so do the costs. While all of this happens inside the Momiji Residence, Momiji is also so much more than just a building. 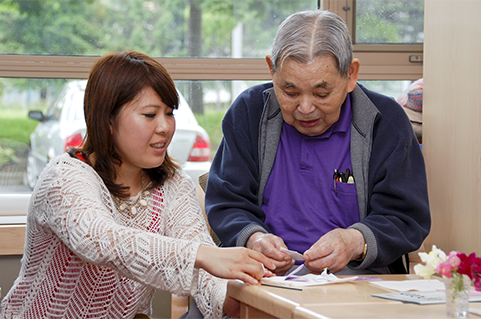 Momiji staff connect seniors in the community with services and programs they need to maintain their quality of life and independence. This includes providing nutritious Japanese meals at our Community Dining programs, friendly visits from Momiji-trained volunteers, personal care services and counselling and information referral services. As the seniors in the community age, their needs continue to grow. This too stretches our resources. Thanks to our volunteers and donors like you, we have been able to accomplish a lot this past year, but there is still much to be done. As we enter our fifth decade, we know that we must continue to provide excellent care – both at Momiji and in the community. We also know that we must innovate in order to anticipate and accommodate the needs of a new generation of seniors while serving the needs of the current seniors. Honouring our seniors by caring for them and preserving their dignity and independence is both a duty and a promise. We hope that we can count on your support during this season of giving to help us continue on with our important work. Please give generously so that helping our seniors today will enable them to do more tomorrow. With best wishes for a healthy and happy New Year. Interested in all things Japanese? 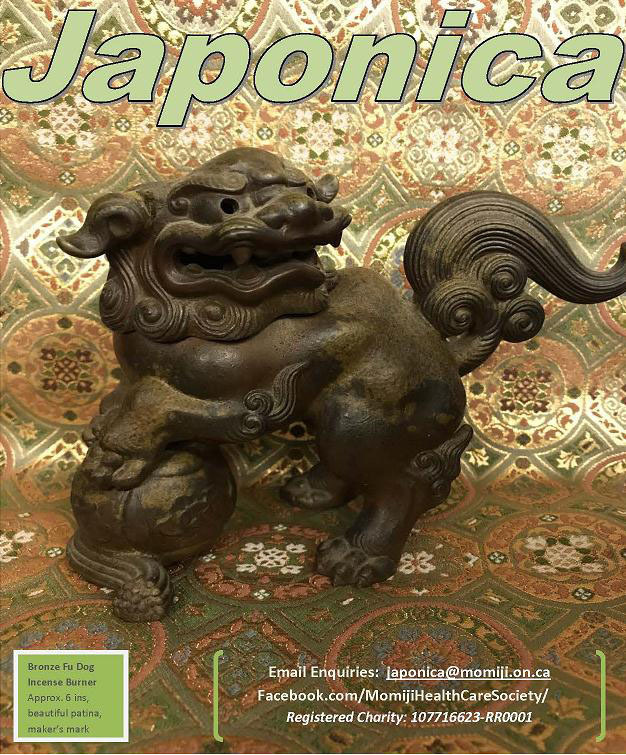 Join us on Saturday, September 8th for our second annual Japonica sale which offers Kokeshi, bamboo, lacquer, Ikebana, tableware and a selection of gently or never-used soft goods including kimono, furoshiki and bags. There will also be a Café with Obento, lunch, teas, coffee, home-baked sweets and much more. For more information about any of our events please visit our website (momiji.on.ca), Facebook page (www.facebook.com/momijihealthcaresociety) or contact Sheri-Lynn at fundraising@momiji.on.ca. Please join us and our Honorary Co-chairs, Donna Hori and Bill Hatanaka, in celebrating Momiji’s 40th Anniversary and the launch of the Momiji Community Wellness Fund. 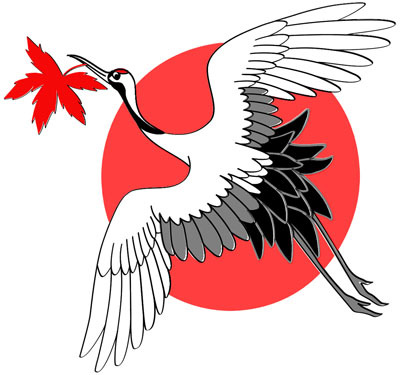 The Gala will be held on Saturday, August 25th at the Japanese Canadian Cultural Centre (6 Garamond Court, North York). Tickets are $300 each, black tie optional. For more information, please contact Sheri-Lynn at 416.261.6683, ext. 259 or by email at 40thgala@momiji.on.ca. 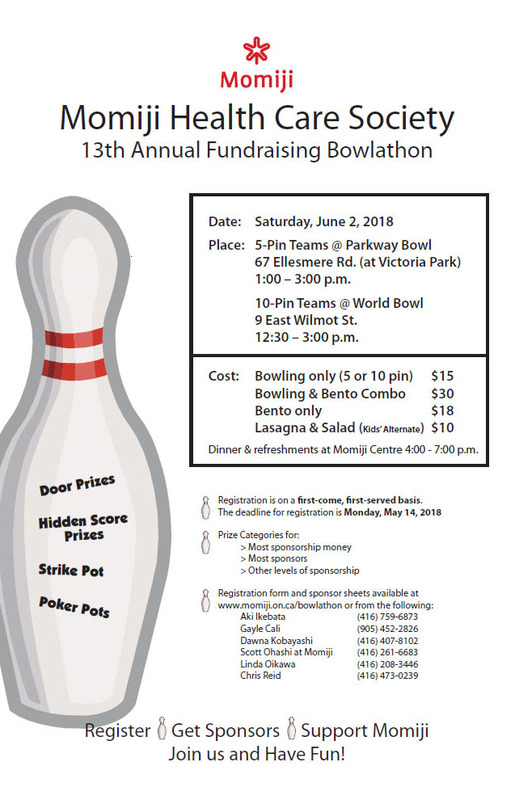 Momiji Health Care Society is pleased to announce its 13th Annual Momiji Fundraising Bowlathon, to be held on Saturday June 2, 2018. The Bowlathon will be held at 2 different locations again this year. Five-Pin Teams will be bowling at Parkway Bowl, starting at 1:00 pm and 10-Pin Teams will be bowling at World Bowl, starting at 12:30 pm. 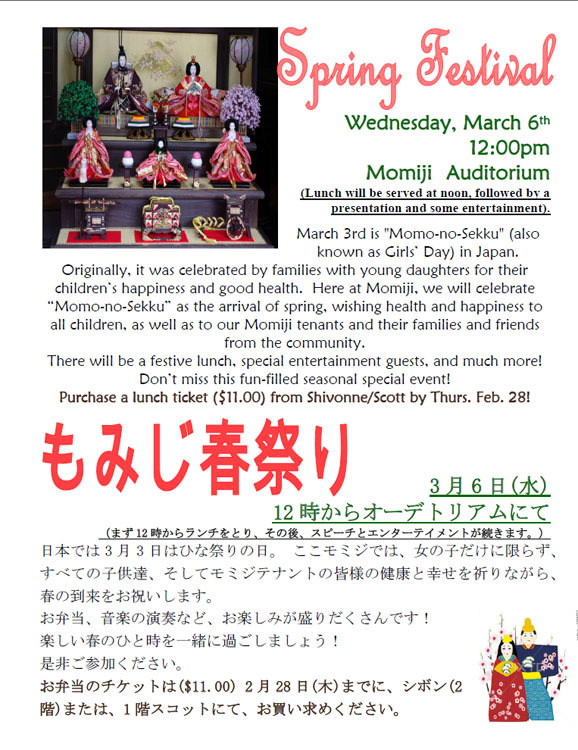 A Bento Box Dinner and Awards Ceremony will follow at Momiji Centre. This is our 13th Annual Momiji Bowlathon, which has become a major Fundraiser for Momiji, in support of our Seniors. Last year’s event raised just over $50,000 which was another new a record! Thanks to you, your family and friends, and members of our Community for the support you have given Momiji. We hope that we can count on your support through your participation and sponsorship again this year. The proceeds from last year’s Bowlathon helped support Programs and Services at Momiji and in the broader community. Bowling fees and the cost of the meal (everyone is encouraged to come for dinner) are priced to be affordable and provide no profit. Your donation and the sponsorships that you successfully solicit from family and friends and community members are the principal fundraising sources for this event. Fill out the Team Registration Form and together with fees for bowling and dinner orders submit it to the Momiji Office or to the committee members or volunteers assigned the responsibility to collecting the forms by Monday, May 14th, 2018. Team Registration Forms will be accepted on a “first-come, first-serve” basis. The Sponsorship Sheets and money or cheques may be handed in to the Momiji Office on or before May 31st or may be handed in at the respective Lanes (5-Pin at Parkway Bowl; 10-Pin at World Bowl) on June 2nd, when the bowlers sign in at the Registration Desk. Bowlers are encouraged to sign up for Online Donations through our Canada Helps site at https://www.canadahelps.org/en/ . On-line donations will be credited to your Sponsorship total, plus Tax Receipts will be issued to the Donors via Email instantaneously. Additional information regarding the Fundraising Bowlathon is attached. We look forward to seeing you at our event this year and hope that you will take advantage of this opportunity to participate with your family and friends at this Fundraising Bowlathon. Team Captains, please encourage all of your team members to get sponsors. Good luck in your fundraising. Delicious Japanese cuisine, including manju, sushi, chow mein and bento boxes. Home made pies, cookies and squares. Add in a café where you can eat in or take out food. Interested? 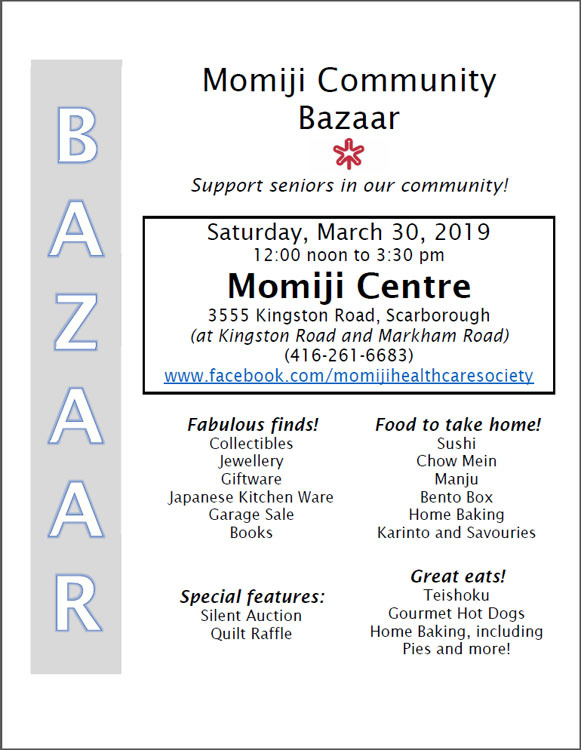 Why not join us at our annual Momiji Community Bazaar. This year’s event will be held on Saturday, March 24th from Noon to 3:30 pm. There will also be plenty of items for sale including Japanese Wares, Collectibles, Pink Elephant, Jewellery, a Garage Sale (held, of course, in Momiji’s Garage) and much more. Interested in volunteering? Volunteers are needed leading up to the day of the Bazaar, for sorting donations, for helping to make all of that delicious Japanese cuisine and of course for set-up. 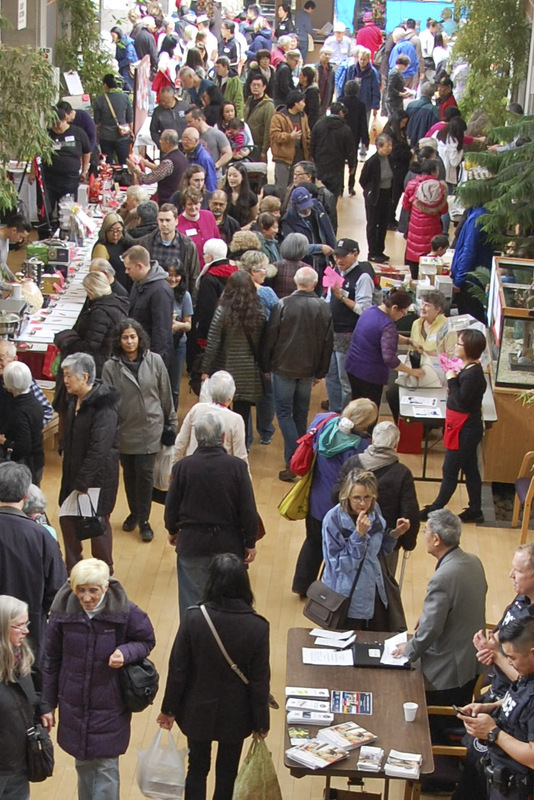 Proceeds from the Bazaar are used to support Momiji’s programs and services. Hundreds of seniors benefit each year from the funds this event generates. For more information, contact Sheri-Lynn at 416-261-6683 x259 / bazaar@momiji.on.ca. Interested in all things Japanese? Join us at Momiji for a NEW event offering finds from our inventory of donated Japanese ‘treasures’. The sale will feature Kokeshi, bamboo, lacquer, Ikebana, tableware and a selection of gently or never-used soft goods including kimono, furoshiki and bags. Many of the objects are mid-century and a few are pre-war. Plus Café – Refreshments – Obento, lunch, teas, coffee, home-baked sweets.